Joel Merriman (1760-1832) may have been among the original settlers who arrived in Cramahe with Joseph Keeler in 1793, as suggested in How Firm a Foundation, but one cannot be absolutely sure. Birthplaces of his offspring are not very helpful, because references differ as to where the first three children were born in 1791, 1792, and 1796. For each, the birthplace has been listed as either the United States or Canada. The first two must certainly have been born in the United States or it would place Merriman in Canada before Keeler. Joel Merriman appeared in censuses starting in 1797 (the earliest one available). The 1797 census reads “on five acres of land cleared and fenced [with a] comfortable house on Lot 1, Concession 24”. This must certainly be Lot 24, Concession 1; there is no Concession 24. The presence of the word “on” suggests that he himself was living there. However, the 1799 census states that he was “residing in the States; said to clear Lot 24 in front; but has not any improvements thereon but said half of the improvements returned to Mrs. Hall No. 28 and 29 in front belonging to him.” This is interesting, because “front” in land records usually refers to the frontage on the lake, suggesting that Joel Merriman’s land was in the Broken Front Concession, not Concession 1. In fact, the crown granted him ownership of Lot 24 in both Concession 1 and the Broken Front Concession in 1802. Lot 24 is just about midway between East Colborne and Salem. It isn’t known who “Mrs. Hall” was, although it is possible that she was the wife of early Cramahe settler Isaiah Hall. Joel Merriman was born in Connecticut. His exact birthplace is listed as either New Haven or Wallingford, which is just 10 km north of New Haven. I suspect Wallingford is correct because New Haven is a larger community and one might easily be tempted to refer to Wallingford as being in the New Haven area, but unlikely to say that New Haven is in the Wallingford area. Joel’s parents were Titus Merriman (1727-1806) and Dinah Andrews (1729-1813). He married Anna Perkins (1772-1847), also of Wallingford, in about 1790. 7 children are recorded: Hiram (1791-1862), Rebecca (1792-1876), Isaiah (1796-1850), Tryphena (1800-1876), Titus (1806-1886), Caroline (1809-? ), and James Monroe (1810-1877). When I first saw the name James Monroe Merriman, it seemed likely that he was named in honour of James Monroe, the fifth President of the United States. But Monroe was elected President in 1816, six years after James Monroe Merriman was born. The Merrimans would not likely have named their child after the Governor of Virginia, which is what Monroe was at the time the child was born. Family members were counted in censuses, though not named, starting in 1803. The table that follows is a comparison of Merriman family member counts from the 1803-1825 censuses compared with the ages of known family members. In the table an M after the age of one of the children means that that child was married. An age in parentheses means that that family member (or for women, her husband) appears elsewhere in the census and so shouldn’t be included in the count for that year in this table. The discrepancies between the ages of the family members we know about and the counts for each year are marked with asterisks. Some are easily explained. For instance, in 1809, I think Hiram was listed as under 16 even though he was 18. Similarly, it looks like the 1820 record of one older female and two younger females was likely an error; it should have been the other way around. On the other hand, there was an extra girl under 16 years old every year until 1810, which is so consistent that it doesn’t look like a mistake. She was probably a fourth sister who died young. There was an extra male over 16 in 1817 who couldn’t have been a son of Joel and Anna because he appeared suddenly for that year only. Perhaps a father, brother, cousin, nephew, etc. (Joel Merriman had four brothers and two sisters who lived to adulthood and might have farmed out offspring to live with their uncle). Or this record might have been mistaken. There were extra younger males who appeared in 1820 and 1822 and an extra younger female who appeared in 1825. These might be other siblings who died in infancy, or they might also be cousins, nieces, nephews, etc. living with the family in those years. Or mistakes. Finally, one of the older males is missing in 1825. This undoubtedly means that Isaiah or Titus had left home by then. Joel Merriman’s eldest son Hiram was born in about 1791. One Cramahe census said he was born in Upper Canada and two said he was born in the United States. Genealogies uniformly place his birthplace as Wallingford or New Haven, Connecticut. However they also tend to list his residences as Connecticut in 1850, Cramahe in 1851, Michigan in 1860, and Cramahe in 1861. He also appeared in Cramahe censuses regularly from 1820 to 1825 and 1839 to 1842, the censuses from 1826 to 1838 not being available. There must have been two different Hiram Merrimans of about the same age, one who spent his life in Cramahe and the other who lived in Connecticut, then moved to Michigan. This puts the Wallingford/New Haven birthplace of our Hiram Merriman into question, although he almost certainly was born in the United States and his parents were from that the New Haven area. Of course, maybe our Hiram Merriman did in fact move from Connecticut to Cramahe, then back to Connecticut, then back to Cramahe, then to Michigan, then back to Cramahe, but I doubt it. Whether or not this is true, our Rogers family moved to Colborne in about 1808. Nancy was listed as “Ann” in the 1861 census, so her name was probably Nancy Ann Rogers. Most references list the date of Hiram and Nancy’s marriage as ca. 1815, although some list ca. 1825. Both of these have problems: Nancy was only 13 in 1815, which may be possible but rather uncomfortable by modern standards. The 1825 date doesn’t work because Hiram was living with a woman over 16 years old in 1820 (see table below), presumably his wife, and their first child was supposedly born in 1823. If you go by the family member counts in the table listing Joel Merriman’s household (see above), the numbers only work if Hiram was present without a wife through 1819. It is likely that Hiram and Nancy actually married in 1819 or 1820, after which Hiram was listed separately in censuses. If so, Nancy’s wedding was when she was around 19 or 20, not 13. Comparing the counts with the ages of known family members, there are some discrepancies (marked with asterisks). In 1821 and 1822 there appears to have been a boy under 16 years old who disappeared by 1823. There was also a girl under 16 in those years who disappeared by 1825. Could these have been children who died young? Since Hiram and Nancy had no children as of the 1820 census, both of these would have had to have been born in 1820 or 1821. On the other hand, the girl could have been Amelia if Amelia’s birthdate was earlier than the one listed in the 1851 census. But then there would still have been an extra girl in 1823 who disappeared by 1825: still a girl who probably died young, but born in 1822 or 1823 rather than 1820 or 1821. There was also an extra boy under 16 in the 1839 and 1840 censuses who wasn’t present in 1851. He was absent from the 1825 census, so he couldn’t have been more than 15 in 1840. He may also have died young or, since he could have been as much as 26 years old in 1851, he may have simply been living somewhere else. Finally, there was an extra male over 16 years old in 1840. This couldn’t have been a son of Hiram and Nancy, because, as discussed above, they couldn’t have had a son older than 15 in 1840 (and besides, this extra older male wasn’t present in 1839). He was probably a brother, cousin, nephew, or some other relation. Or a mistake in the census. Hiram Merriman was listed as a joiner in the 1842 census, a chair maker in 1851, and a cabinet maker in 1861. Clearly a carpenter by trade. Land Office records refer to him only as a “gentleman”. He was on the Board of Trustees of the Episcopal Methodist Church when, in 1830, the Board purchased the property at the corner of Church and Percy Streets where the United Church now stands. 1. In 1832 he purchased Reid Lot 172 from Joseph Abbott Keeler. This was on the north side of King Street between what is now Victory Street and Elgin Street, and corresponds to the modern properties at 69, 71, and 73 King Street. In 1838, Merriman added the adjacent Reid Lot, 171, which he purchased from his brother-in-law George Stephens (see below). This is now 67 King Street. In 1845 he again added to this property by purchasing Reid Lot 174 from Joseph Abbott Keeler. This lot lies north of the Lots 69 through 73 on King Street (i.e., everything between the back yard of the Seaton House and Elgin Street). Its northern limit is now on Church Street, although Church Street didn’t exist at the time. In 1852 James D. Goslee sold him a strip along the northern edge of Reid Lot 173 to add to this property. 2. In 1851 he purchased Reid Lots 2A, 3, and 4 from Ozem Strong. This is the property that lies between Old Percy Road and Percy Street from the modern location of the Northumberland Veterinary Hospital south to what is now 53 Percy Street. This was the sale that cut off a section of property from any road access except from Percy Street, and established the estimate for the latest date at which Percy Street could have been constructed (see discussion of Percy Street elsewhere). 3. In 1860 he purchased Reid Lots 221, 225, and 226 from Joseph Keeler III. Lots 225 and 226 were directly across King Street from Merriman’s Lot 172, and Lot 221 ran south from there to what is now the back edges of the properties along the south side of Simmons Street. Simmons Street was absent at the time. All of these properties were inherited by Nancy Merriman when Hiram died in 1862. Nancy sold Reid Lots 2A, 3, and 4 to George Nelson Gordon in 1866 (see discussion in the Gordon write-up; Gordon was married to Hiram Merriman’s niece Sophia Tryphena Webster). All of the rest of the properties except for part of Reid Lot 172 were sold by Mary Frances Merriman to Daniel Lewis Simmons in 1874. The remaining bit of Lot 172 retained by Mary was inherited by Henry Isaiah Merriman, her husband (and cousin), when she died. Joel and Anna Merriman’s second child was Rebecca (b. 1792, d. 1876 or 1878). Genealogies vary on the details of her death. Some say 1876 in Brighton, others 1878 in Belleville. Rebecca married Joshua Webster (1793-1878), a farmer who appeared in Cramahe records through 1842, but thereafter was listed in Brighton Twp. Though it hasn’t been determined specifically where he lived, it was probably in that part of Cramahe Twp. that was transferred to the newly organized Brighton Twp. in 1851. Joshua Webster was descended from John Webster (1590-1661), an early New England settler and one time Governor of the colony of Connecticut. The Websters had eight children: Anna Janette (1818-1888), Lavinia Lannier Beriah (1820-1820), Caroline Lavinia (1823-1913), Sophia Tryphena (1825-1910), Mary Beriah (1828-1914), Cornelia Rebecca (1829-1921), Joel Merriman (1832-1913), and Henrietta V. (1834-1875). Sophia married George Nelson Gordon as discussed in the Gordon Family write up. The family member counts for early census records for Joshua Webster are presented in the following table. Discrepancies are marked with asterisks. There was an extra girl in 1821 and 1822. However, although most genealogies list Lavinia’s date of death as 1820, and that is what is reflected in the table, some say “about 1820”. I think she probably died in 1822 or 1823, accounting for the unidentified girl in the counts. Or maybe it was another girl who died young. There was also an extra adult male in 1839 and 1840. This could not have been one of the offspring of Joshua and Rebecca, and so must have been some other relation. One adult female was missing from the 1840 census; I suspect Anna was probably living elsewhere at the time, although she wasn’t to marry until about 1847. Child number three of Joel and Anna Merriman was named Isaiah (1796-1856). He appeared by name in no Cramahe census, so he was gone by 1851. Several genealogies have him dying in Genessee County, Michigan in 1850 (although his gravestone says 1856). If this is the same Isaiah Merriman, he was granted his land in Michigan in 1837. In fact the land grant has US President Martin Van Buren’s, signature on it. This grant also stated that Merriman was a resident of “Sagana” County, Michigan at the time. Saginaw County and Genessee County are adjacent to each other just south of the “thumb” in Michigan. Isaiah’s son George was born in Pontiac, Michigan in 1834, so apparently Isaiah immigrated to Michigan some time before then. Family member counts suggest that he was still living in Cramahe in 1824. It wouldn’t be a surprise if he was the son who disappeared from the Joel Merriman household by 1825 (see above). Isaiah Merriman was a farmer. He married Caroline P. Dean (1804-1892) in about 1833, but it is unknown if this was in Canada or the USA. There was a Samuel Dean in Cramahe in the 1830’s, but a clear connection between him and Caroline can’t be made. There is a reference to two children for Isaiah and Caroline: George Benjamin (1834-1918) and Helen Mary (1841-1905), both born in Michigan. Tryphena Merriman (1800-1876) was the first of Joel and Anna’s children who, it appears, was born in Cramahe, although one genealogy (out of several) continues to cite New Haven, Connecticut as her birthplace. She married George Stephens (1805-1875), a cabinet maker from Cobourg, in 1828. There is no reference to children. George Stephens purchased Reid Lot 170 (now 65 King Street) from Joseph Abbott Keeler in 1824 and sold it to William Bradbury of Toronto in 1836. The sequence of events was probably as follows: Stephens came to Cramahe sometime around the early 1820’s and worked with fellow cabinet maker Hiram Merriman. He purchased property in 1824, but he still wasn’t listed as a head-of-household in the 1825 census. Four years later he married Hiram’s sister. They probably continued to live in Colborne for a while, perhaps until 1836 when they sold their Colborne property. They probably then moved back to Cobourg, where they lived for the rest of their lives. Titus Simeon Merriman (ca. 1806-1886) was child number five in the Joel Merriman family. He resided in Cramahe for his entire life and was employed primarily as a farmer. The 1881 census and his death record in 1886 (he died of heart disease) listed him as a “gentleman”, which probably means he was retired by then. The 1861 census listed him as a constable. Titus Merriman married a woman named Hannah (1814-1897) some time before 1834. Her last name was Rose, but this is only because her gravestone in the East Colborne Cemetery says “Hannah Rose, wife of the late T. S. Merriman”. Was Rose her maiden name or her middle name? There are no genealogies listing Titus and Hannah’s children, but from various sources a list of eight can be established. Webster (ca. 1834-? ), Titus S. (ca. 1836-? ), Almira J. (ca. 1840-1885), Hannah Maria (ca. 1843-1894), George (ca. 1847-? ), Henry Isaiah (1850-1920), Charles Frank (ca. 1854-1875), and Tryphena E. (1858-1932). There is no further information about Webster, Titus, and George. Webster was about 17 and Titus about 15 when they were listed in the 1851 census, but neither was included in 1861. Did they die or simply move away? Similarly, George was present in 1851 and 1861, but absent by 1871 when he would have been about 24 years old. Again, died or moved away? Almira Merriman was a schoolteacher at the time of her death in 1885 in Colborne. She was unmarried. She purchased Scott Lots 1-12 along the south side of Scott Street in East Colborne from Reuben B. Scott in 1869, but they were back in Scott’s hands in 1877. There is no record of their return to Scott. Hannah (she went more often by “Maria”) Merriman married Samuel Alonzo Miller (1840-1871) from Brighton in 1864 in Colborne. They had a single son, Fred (1865-?). Samuel died in 1871 and Maria remarried in 1878, this time to Nelson Joseph Dailey (1840-1928), merchant, of Colborne. No reference to children from this second marriage can be found. At the time he married Maria Merriman, Dailey owned Reid Lots 257 and 258 on the south side of North Street. He and his wife later (1881) purchased Reid Lots 54, 54A, and 55 along the west side of Percy Street from William Coxall (now numbers 11, 15, 17, and 19 Percy Street). They sold these properties off between 1892 and 1900. As mentioned above, Henry Isaiah Merriman married his first cousin Mary Frances Merriman in 1876. They don’t appear to have had any children and she died of heart disease in 1877. Henry then moved to Minnesota, where he married Christina A. Wilson (1851-1956) in 1878 and had three children: Marian (1881-? ), Helen (1886-1920), and Mark Henry (1888-1972). Henry was not in the 1871 census, but by 1880 he was living in Wells, Minnesota. In 1910 he was living in Clark, Minnesota. He died in 1920 in Douglas, Oregon. He was a cabinet maker, a trade he no doubt learned from his uncle Hiram. Frank Merriman died of pneumonia in Colborne in 1875 at about the age of 21. There is no record of a wife or family. He was employed as a printer at the time of his death. Tryphena Merriman married George F. Macklam (1858-1946) from Brighton in 1880. Macklam did not appear in any Cramahe censuses, but he and Tryphena lived in Colborne in the mid 1880’s, as evidenced by the birth of all three of their children there: Frank Percival (1882-1905), Ralph Merriman (1887-1944), and Nina Rose (1889-1893). The Macklams moved to Michigan in 1890. While residing in Colborne, George Macklam was a telegraph operator, although an 1887 gazetteer listed him also as a life insurance agent. In Michigan censuses, he was listed as a railroad station agent. As above, the discrepancies are marked with asterisks. There is an extra woman in 1839 and an extra man in 1840. There is also an extra boy in 1839. Titus and Hannah were too young to have had adult children in 1839 and 1840, so the extra adults must have been other family members. Was the extra young male in 1839 another child who died young? All of Titus Merriman’s land dealings were in Concession 2, Lot 28. In other words, in East Colborne. He received the southern half of the Lot from Jacob Loomis in 1832, and sold bits and pieces of it to various people over the next 14 years, the biggest chunks to his brother James. Joseph Abbott Keeler, Reuben Scott, and George Stephens all purchased lots in 1832. Other purchases were by James M. Merriman in 1833, Reuben Scott in 1834, Eliza Chapin in 1839, James M. Merriman in 1846, and John M. Grover in 1846. Caroline Merriman, child number six, was born in Canada, presumably Colborne, in about 1809. There is no other information about her. The last of Joel Merriman’s children was James Monroe Merriman (1810-1877), who, like his brothers Hiram and Titus, remained in Colborne until his death (of Bright’s disease, which appears to be an old name for chronic renal failure). He ran a saw mill in the 1840’s and into the 1850’s, but all references after 1857 listed him as a customs collector. I wonder how popular that made him…. 1833: Purchased Reid Lot 197 from his brother Titus. This was on the southwest corner of the junction of Furnace Road and Mill Street. Furnace Road is now Parliament Street and Mill Street no longer exists. It was a road that ran east-west between Durham Street and Furnace Road about 150 m north of the Kingston Highway (King Street). 1846: Purchased Reid Lot 190 from his brother Titus. This was most of the property in Concession 2, Lot 28 west of Furnace Road and north of Mill Street, running north about 200 m. There was a saw mill located on this property. It was called the “Merriman Saw Mill Lot” when James bought it from TItus, but on the 1862 Reid map it is referred to as a grist mill. John M. Grover appears to have been involved in the ownership of this property in some way that is unclear, but it was clearly in the hands of James Merriman by 1850. This property was sold by Robert Lawrence in 1875, though there is no record of its transfer from Merriman to Lawrence. Robert Lawrence was a miller in Colborne in 1871, but he must have arrived after the 1871 census was taken. 1852: Purchased Reid Lot 215 and Reid Block K from Peleg Wood. This is across the highway from the entrance to Furnace Road/Parliament Street. Lot 215 was sold to Bradford Patterson four months later, but Patterson apparently defaulted on his mortgage and Merriman again owned the property by 1854. Lot 215 and Block K were sold to Isaac P. Powers in 1864. 1853: Purchased Reid Lots 199 through 208 (excluding 205) from Marie E. Strong, daughter- in-law of Ozem Strong and sister of James’ sister Ann’s husband Oren Keeler Strong (see below). (What do you call your relationship to your sister’s sister-in-law? Is it still sister-in- law?). This property comprises almost all of the southeastern corner of Lot 28, south of the land along Furnace Road owned by Ruben Scott. Reid Lots 202-208, fronting on King Street, were sold off over the next few years: 202 to Patrick Barry in 1853, 203 to Isaac Gould in 1854, 204 to Thomas Webb in 1855. He sold off the remainder of this property partly to Samuel Hambley in 1855, partly to Charles Kinney in 1855, and partly to Roswell Chapin in 1856. 1857: Purchased Reid Lot 122, on the north side of King Street West, from Joseph Keeler in 1857. This was sold to Simon H. Payne when Merriman died in 1877. These transactions match the occupations listed above for James Merriman: He ran the Merriman Saw Mill in East Colborne in the 1840’s and 1850’s, but sold off most of his East Colborne properties and moved to Colborne (likely when he bought property to live on) in 1857. The thereafter made his living as a customs agent. 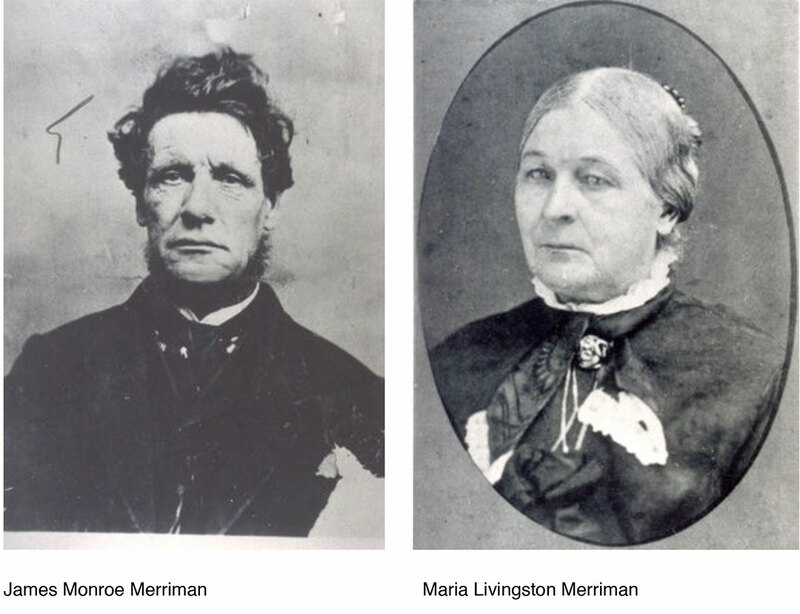 James Merriman’s wife was Maria Livingston (ca. 1810-1892). The birthplace listed on her death record was Kittley, Ontario, and several genealogies agree that she was born in Canada. On the other hand, several other genealogies list Salem, Washington Co., New York as her birthplace. The Canada connection is the most believable because it appears on an official document (not that they are guaranteed to be error-free). James and Maria were married in 1831, apparently in Rochester Co., New York. As with most of the other Merrimans, there is no genealogy listing their children, but there is a list from other sources: Laura (ca. 1833-? ), Lavinia (1835-1920), Anne Elizabeth (1836-1919), George Isaiah (1843-1917), Anneta Gertrude (1845-1927), Ellen (ca. 1846-? ), and Harriet Calista (ca. 1852-?). There is no further information about Laura Merriman. Lavinia Merriman married Milton Kingsley Lockwood (1825-1914), a customs collector from Brighton, in 1857; Lavinia apparently married her father’s co-worker. Or maybe James M. Merriman took up the profession after a customs collector married his daughter. Land office records list Lockwood as a resident of Colborne at least from 1856-1858, but from the 1861 census onward he and Lavinia lived in Brighton. Every census through 1901 continued to list Lockwood as a customs collector, but in 1911, when he was 86 years old, he was listed as a notary public. There is no indication that the Lockwoods ever had any children. Lockwood purchased Reid Lots 134 and 135 on the south side of Church Street West from Joseph Keeler in 1857 and sold them back to Keeler in 1870. It is likely that he and Lavinia lived there while residents of Colborne. Anne Elizabeth Merriman (1836-1919) married Ozen Keeler Strong (1832-1877) in about 1856 in Cramahe. Strong was the youngest son of Ozem Strong and Clarissa Keeler. One could be forgiven for thinking he was named “Ozem” rather than “Ozen”, but it is spelled “Ozen” with an “n” on his gravestone. His occupation was “clerk”. A list of his children is somewhat problematical. Trees By Dan lists five children: Charles (b. 1857), Frederick (b. 1860), Ozen (b. 1862), Anna Maria (b. 1865), and Augusta (b. 1868). These are lifted from the 1871 census. On the other hand, there is a small gravestone in the Lakeport Cemetery that lists Charles, William, James M., and Stuart M., without dates, and findagrave.com indicates that they were the children of Ozen Keeler Strong and Annie Elizabeth Merriman. The only overlap between these lists is Charles. Perhaps the others died young (they apparently didn’t warrant gravestones of their own). Or perhaps findagrave.com is mistaken: most of the names on the gravestone are found among the offspring of Ozen Strong’s siblings, though not all of a single sibling and the initials don’t always match. Ozen Strong died in 1877 and Annie remarried in 1878, this time to a Cramahe farmer named John J. McColl (1835-1910). There is no record of children. Interestingly, Annie is buried with her first husband, not her second. Ozen K. Strong purchased Reid Lots 120 and 121 on the north side of Church Street West from Joseph Keeler in 1857 and sold them to Thomas Scott in 1858. George Isaiah Merriman (1843-1917) was a station agent for the Grand Trunk Railway who lived his whole life in Colborne except for a brief period when he worked as a railway station agent in St. Lambert, Quebec. In fact he was a resident of St. Lambert when he married Jane Isabel Casey (1852-1931) in 1870 in Brighton. Jane Casey was the daughter of Stephen Niles Casey (1820-1861) and Emma Ann Keeler (1827-1850), one of the two daughters of Joseph Abbott Keeler who died young and who at one time or another owned the Seaton House (see write-up for that house elsewhere). George and Jane had three children: Annie Lavinia (1871-? ), Vinton Radford Keeler (1872-1941), and Georgina Gilchrist (1883-1971). Annie and Vinton were born in Quebec. Georgina was born in Colborne. Annie married Richard Robinson Harte (1858-? ), a customs broker from Hamilton, Ontario in 1893 and moved back to Hamilton with him. They had two daughters: Kate Symington (1894-?) and Agnes Merriman (1900-?). 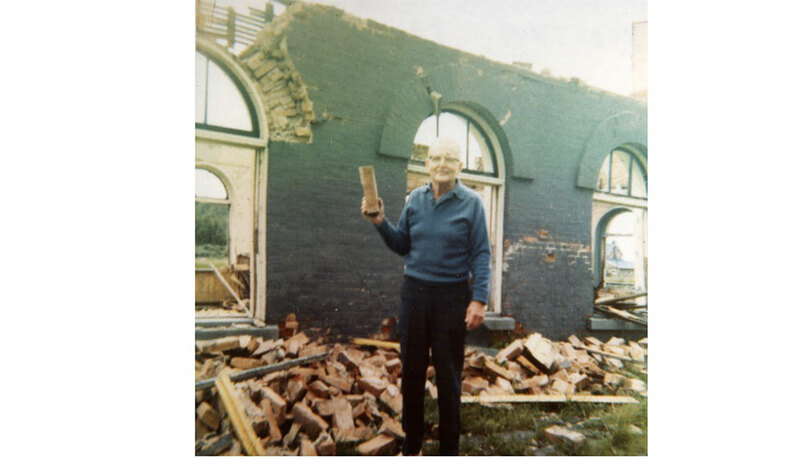 In 1895 Vinton Merriman moved to Buffalo, New York, where he worked as a railway clerk and boarded in a house owned by Philip and Lena Duchsherer. Vinton married Lena’s sister Julia Ida Klopp (1869-1946) in 1901. They had three children while living in Buffalo: George Allen (1901-1934), Evelyn (1905-? ), and Vinton Monroe (1906-1973). In 1908, the family moved back to Colborne, and Vinton and George appeared there in the 1911 census. The records do not show where Julia, Evelyn, and Vinton Jr. were at the time, but the 1921 census states that they had moved to Canada in 1908 as well. By 1921, the entire family was living in Toronto. Vinton Sr. was working as a baggage man, presumably for a railroad, at that time. Unfortunately, his occupation in the 1911 census is illegible. George I. Merriman’s last child, Georgina Gilchrist Merriman (1883-1971) married Jerram Bovell Connell (1884-? ), a bank clerk born in the West Indies but residing in Brantford, Ontario at the time of his marriage in 1907. Georgina was still a resident of Colborne at the time, but the wedding took place in Toronto. There was a single child, John Ernest (1907-?). In 1911 the Connells were living in St. Thomas, Ontario where Jerram worked as a bookkeeper. By 1925 they had moved to New York City, though John was no longer living with them. George Isaiah Merriman purchased Grover Lot 120 from John M. Grover in 1864 and sold it to Arthur B. Cheffins in 1890. This was on the south side of what used to be Queen Street. Currently Kensington Avenue goes south to Alfred Street, and a dirt road continues southward. This dirt road marks the former route of Kensington Avenue, and there was once a series of cross streets that no longer exist: Princess, Albert, Queen, Russell, and Spring, then the Grand Trunk Railway, then Grover and Napier streets to the south. Queen Street was about 200 m south of Alfred Street and the Merriman Lot was then about 100 m east along Queen Street. This is just open land at present; no houses exist in the area. The fourth daughter of James and Maria Merriman was Annetta Gertrude (1845-1927). She married watchmaker John Hamilton (1842-1923) sometime before 1869. Censuses listed four children: William Monroe (1869-1946), George A. (1872-? ), Charles Kingsley (1873-? ), and Mary L. (1877-?). William was born in Norwood, Peterborough Co. It isn’t possible to tell where the other children were born, but it is clear that the family moved around quite a bit. The censuses listed them in Asphodel, Peterborough Co. in 1871, Brock, Ontario Co. in 1881, Harriston, Wellington Co. in 1891, and Kingsville, Essex Co. in 1901. They are not in the 1911 census, but Annetta was living in Ingersoll, Oxford Co. with her married daughter in 1921. 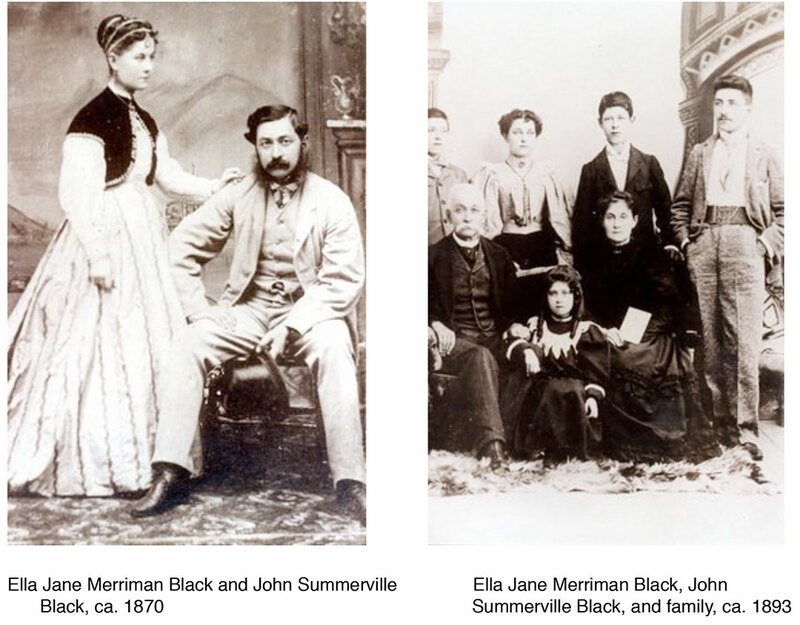 Ella Jane Merriman (1847-1920), the next James Merriman child, married a merchant from Stirling, Hastings County named John Summerfield Black (1834-1903) in 1868 and moved with him back to Stirling. In subsequent censuses his occupation was listed as “conveyancer”. The Blacks had eight children, all born in Stirling: John Monroe (1870-1947), Harry Summerfield (1872-1934), Winnifred Maria (1874-1939), Charles (1877-1878), Charles Dickenson (1878-1957), Byrne Merriman (1880-1968), Harriet Edna (1886-1970), and an unnamed daughter (1887-1887). Ella died in Toronto in 1920. Harriet Calista Merriman (ca. 1852-?) was the last of James Monroe Merriman’s children. 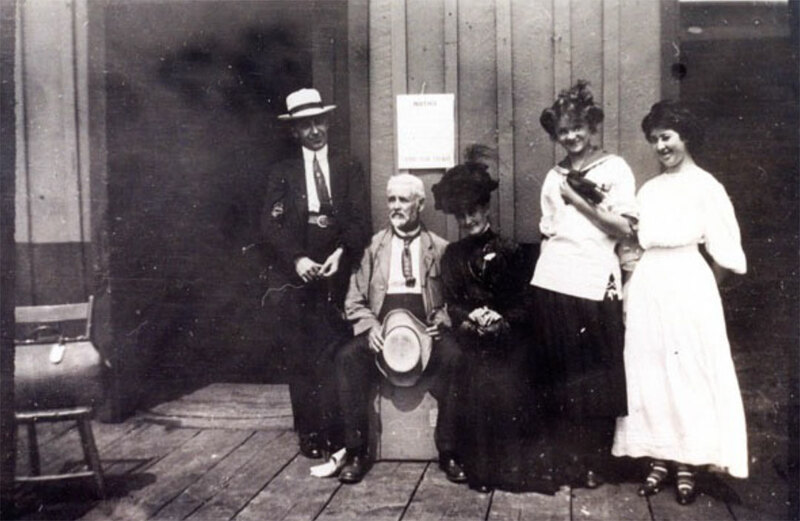 She married Trenton merchant George A. Smith (ca. 1845-?) in 1871 in Colborne. It has not been possible to trace the Smiths after that. Unfortunately “George and Harriet Smith” is not a particularly uncommon pair of names for the era. There is a genealogy that lists them as farmers in Essex County, Ontario, but birth and/or marriage records for the children of the Essex County Smiths indicate that their mother’s maiden name was Harriet Snider, not Harriet Merriman. Our Harriet was only 19 when she married George Smith, so it isn’t likely that she was married to someone named Snider first, although that option cannot be ruled out entirely. Even stronger evidence that this was a different George and Harriet Smith, though, is that their youngest child was born in 1864, seven years before Harriet Merriman married George Smith. Our Harriet was only 12 years old in 1864. The Merrimans were clearly important in the early history of Colborne, centred as they were in East Colborne and on the residential area along King Street between Victory Lane and Elgin Street.